What is the Urban Development Boundary? When you fly into MIA from the west, you are looking down on miles and miles of Everglades with no sign of human habitation, and then suddenly you are over a densely populated urban area. The transition is like night and day, and the reason is something called the Urban Development Boundary (or UDB). 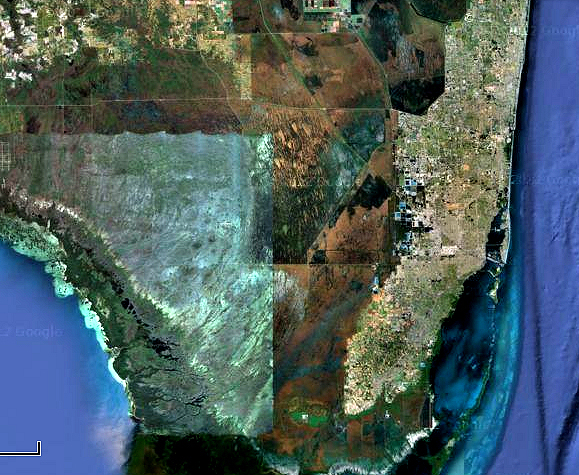 The UDB is the line that keeps development from intruding further into the Everglades and coastal wetlands. 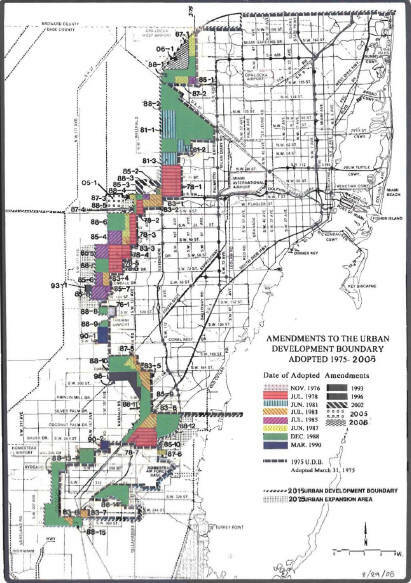 The main reason I’m writing about this now is that the UDB is the subject of one of the proposed changes in the Miami-Dade charter that is being voted upon in the November election. At issue is incorporating into the county’s charter the current county law requiring a two-thirds majority to move the UDB to allow development in lands that are now undeveloped or agricultural. This is actually one of those better-half-a-loaf-than-none measures, since a three-fourths majority would be preferable, but it does offer some more protection than a simple majority. To be honest, I had never heard of the UDB until I started following Eye on Miami’s posts on the subject. (The New York Times considered it worth a feature article back in 2007.) But I quickly became convinced of the importance of this issue to the future of our community. First a little background and geography lesson: On a conventional map, Florida looks like a broad peninsula over a hundred miles wide. But when you see it in a satellite image, you realize that what we think of as South Florida is really just a narrow finger of land along the Atlantic no more than 10 – 15 miles across. We live where we do because a thin limestone ridge parallel to the coast lifts the land a few feet above the ocean on the east and the Everglades on the west. 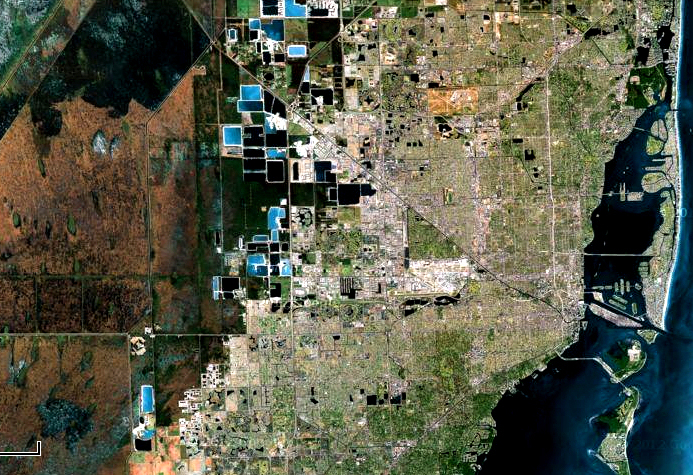 In the hundred years or so since Miami and other communities were established, developers have pushed settlement westward into the Everglades by landfill and swamp drainage, which has resulted in a lowered and distressed water table (which we all depend on) and deterioration of the Everglades ecosystem as the urban sprawl has expanded. The sprawl has in turn created the traffic nightmare that area commuters experience daily. The pressure is incessant. Earlier this year, the Ferro Investment Group submitted an application to expand the UDB to include 10 acres in West Kendall and rezone the parcel from agricultural to commercial. Approval would mean an adjacent and larger agricultural parcel would be surrounded by commercial development on three sides and therefore ripe for picking on the next round. Development doesn’t just mean environmental degradation—it also means that taxpayers pick up the tab for the infrastructure that the county must provide to support the development. The anti-environmental Scott administration in Tallahassee has made local resistance to moving the line even more tenuous. As Eye on Miami put it: Until the Republican-led Florida legislature gutted the Growth Management Act this spring, approved by incurious, indifferent Gov. Rick Scott, the Florida Department of Community Affairs provided pressure against local county government from doing what powerful lobbyist/law firms and their speculator clients wanted: strip malls, commercial centers, and platted subdivisions wherever and whenever they could find bank financing. The local state senator who has been most active in gutting this environmental protection is Ellyn Bogdanoff (R-Broward), who introduced a bill in May that would make it easier to move the UDB (which, fortunately, failed). You know Bogdanoff—she’s the one surrounded by those adorable kiddies in her campaign commercials. You’d never know from her ads that she is also the leading shill for the Genting gambling behemoth behind the push for megacasinos in South Florida. Long story short: The measure now on the November ballot is a slender reed in the battle against the ongoing destruction of the Everglades, but it’s one of the few we have. Vote YES on this one. And vote for Maria Sachs against Ellyn Bogdanoff.